Attach to a non-story, non-Ancient One card. 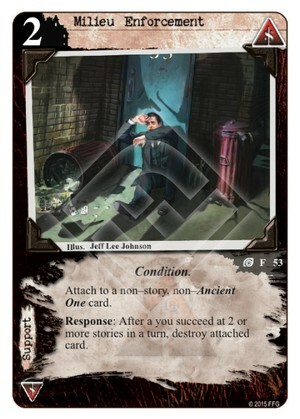 Response: After a you succeed at 2 or more stories in a turn, destroy attached card. Of course it can hit pretty much anything, but if you're succeeding already at multiple stories in a single turn, things are looking good anyway. Can help seal a game going well for you, but I prefer cards that can really turn the tide in my favour... 2/5. I think there's more to this card than meets the eye. In the past, I would have agreed with Corwin81's critique, but Syndicate has recently seen several cards that can cheat Milieu Enforcement into working. Wheelman can trigger the Enforcement if he's paired up with a big friend, Escaped Convict is pretty good at getting you at least one unopposed success at a story, and the entire Nyarlathotep/Avatar mechanic sneaks unopposed Avatars through on the regular. So, in the right deck, the Milieu is a versatile source of removal that can go off even when things aren't going your way. Yeah, it really is not bad. Syndicate has enough ways to trigger the response and versatile hard removal is never bad (although the surprise factor of this one is as low as it can get).